Shop Your Way Bookmarklet retrieves the web page you've submitted, extracts the product information from it, and creates a new product on Shop Your Way. If this product already exists on Shop Your Way it will be automatically suggested to you. How does the bookmarklet work? Shop Your Way extracts the product information from the current web page and creates a new product on Shop Your Way. If this product already exists on Shop Your Way, we'll let you know. Adding the bookmarklet is similar to adding any bookmark (or adding a page to "favorites" on your browser). You can remove the bookmarklet at any time by right-clicking your mouse and then selecting "Delete." The Shop Your Way Bookmarklet only works if and when you click it and does not install anything else on your computer outside of the browser. You can learn more about bookmarklets at this helpful Wikipedia page. 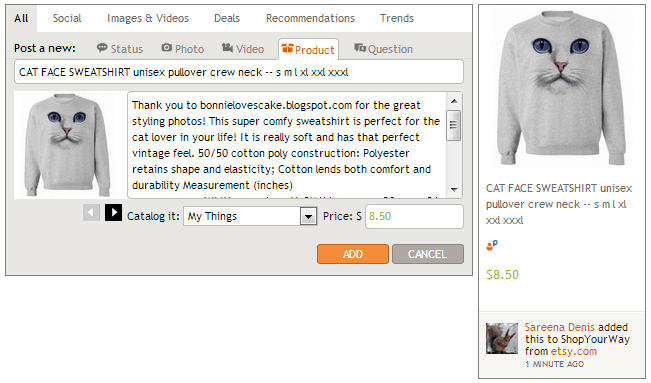 You can install the Shop Your Way Bookmarklet on FireFox 2 and 3, Internet Explorer 8 and 9, and Chrome. Get the Shop Your Way Bookmarklet! You can install the bookmarklet by dragging it to your browser's “bookmark” bar. Doing this is similar to adding any bookmark (or adding a page to "favorites" on your browser). You can remove the bookmarklet at any time by right clicking it and then selecting "delete." The Shop Your Way Bookmarklet only works if and when you click it, and does not install anything on your computer outside of the browser. You can learn more about bookmarklets on this helpful WikipediaPage. To get started and install the Shop Your Way Bookmarklet, click here. 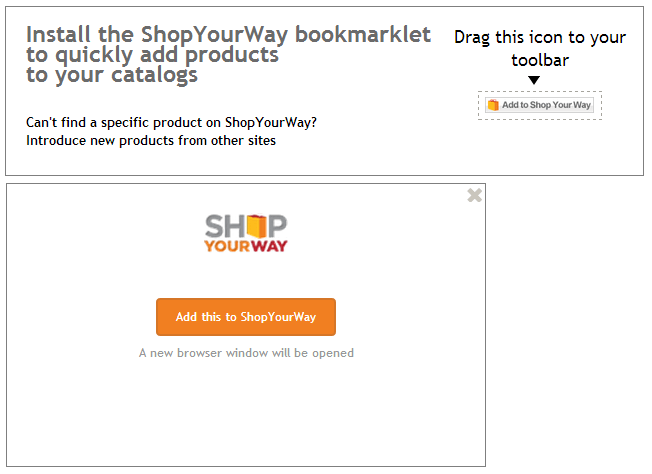 The Shop Your Way Bookmarklet is compatible with the following browsers: Windows Explorer 8 and above, Firefox, Safari, and Google Chrome.